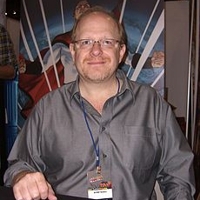 Mark Waid is well known for his eight-year run as writer of the DC Comics’ title The Flash, as well as his seminal work on Kingdom Come and Superman: Birthright. In addition, Waid served as Editor-in-Chief and Chief Creative Officer of BOOM! Studios from 2007 to 2010, where he created and wrote Irredeemable and Incorruptible. In 2012, he launched and co-created thrillbent.com, an experiment in new-media publishing, as well as winning multiple Harvey Awards for his work on Daredevil. In addition to Insufferable for thrillbent.com, he is currently working on Daredevil and Indestructible Hulk from Marvel Comics and The Rocketeer: Cargo of Doom for IDW.